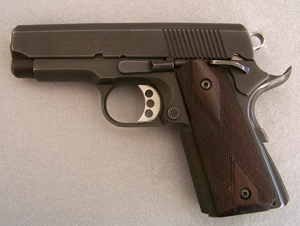 This is my personal handgun; the first full custom 1911 I built, and is also the first handgun that I checkered. It was built in 1983. I made a one piece mainspring housing and moved the back strap way in. I also made the right side of the ambidextrous safety. The slide and barrel came from AMT and was fitted to the frame so that there is only .001" play. The barrel/bushing is fitted to .001" also, and the bottom lugs of the barrel are a squeak - literally. Except for the blade, the rear sight was made from scratch, as well as the firing pin stop. (You couldn't get an oversized firing pin stop in 1983) I wanted a perfect fitting magazine release button, so this was also made from scratch. This handgun is a dream to shoot as the extra weight at the muzzle dampens recoil down to almost nothing, and with the longer sight radius and tight tolerances mentioned above, it is extremely accurate, and a joy to shoot. This is also my personal handgun. It is built using Caspian slide and frame, and is strictly for up close and personal use, however I shoot 25 yards with it and it can shoot 6 inches with just the trough sight at that distance. It has a Nowlin match grade barrel as well as a match grade bushing. The front strap is checkered and greatly relieved at the top. The back strap was brought in and the mainspring housing cut down and re-checkered. The grip safety tang was re-contoured. The firing pin stop is oversized with a matching extractor, and it is ramped and throated for reliability of feeding. The slide is heavily beveled for carry, and the magazine well is also beveled. I have put a lot of rounds through this handgun and it has never even hick-up 'ed, let alone chocked; not one time from the very first trial shots. This handgun was built for carry. The firing pin stop is oversized with a matching extractor for reliability. I changed the recoil system to a Kings reverse plug, full length guide rod system. The lock work was upgraded with match grade parts; the sighting system is a custom, extra wide notch Novak style rear with an MGW front. The front strap is checkered with the upper front strap/trigger guard area greatly relieved so the owner can get as much grip as possible; the back strap is moved forward and the mainspring housing cut down accordingly and re-checkered. The tang portion of the grip safety has been re-contoured. The muzzle has an 11 degree crown, the magazine well is beveled and is ramped and throated for feeding reliability. This is another of my personal handguns and I am only showing it because it has an example of the way I make grips for double action revolvers. No wood over the front strap, just following the grip frame Elmer Keith style. Grips of this style, Smith and Wesson/Magna-Grips, have a perfect palm swell to them and make the gun settle very naturally in the hand. Elmer Keith knew this and used this style on all of his Smith and Wesson's. The action is fine tuned and this is another sweet shooter. 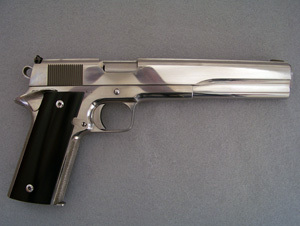 This handgun has it's action tuned and lightened and the hammer bobbed, re-contoured and re-case colored. The chamber mouths are beveled and the barrel throat is chamfered. 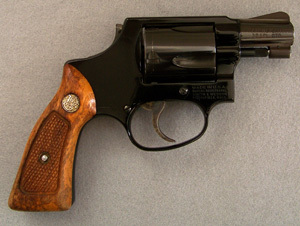 It is a backup carry gun for the most part, but sometimes used as a primary by the owner. 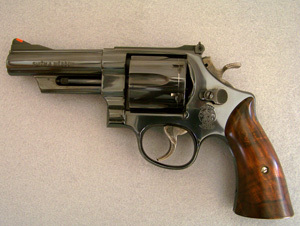 This Colt Officers Model was built for CCW use. It has a heavy bevel and trough sight for ease of draw and up close point shooting. The front strap is checkered and raised moderately to fit the owner. The main spring housing is arched, also to suit the owners requirements. 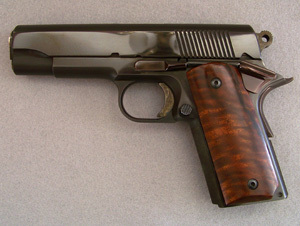 The magazine well is beveled for quick reloads and a beavertail grip safety was added as well as an extended thumb safety. It is ramped, throated and polished for reliability. 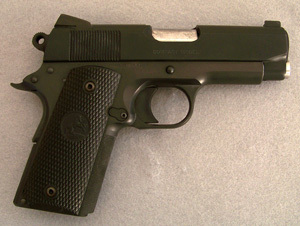 The recoil system was replaced with a reverse plug system and the lock work was replaced with match grade parts. This is a daily carry gun. 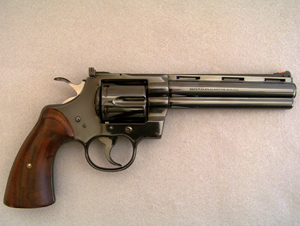 This Colt Python is an example of how I make grips for these beautifully crafted revolvers. I hope you can see the scalloped area at the top and the carefully sculpted shape of the grip overall. It retains a lot of the traditional Python look and also displays the older traditional look of Colt double action revolvers from the past.